In New York, there’s a historic building at almost every turn. Wind your way to the Great White Way and see a show in any of the restored early-20th century masterpieces lining Broadway (maybe If/Then at the Richard Rogers). Or, for a more recent restoration, travel to the Upper East Side to visit the newly opened Cooper Hewitt Design Museum. Housed in the former Carnegie Mansion, by Babb, Cook & Willard, this 1901 masterpiece is as beautiful as it is interesting. 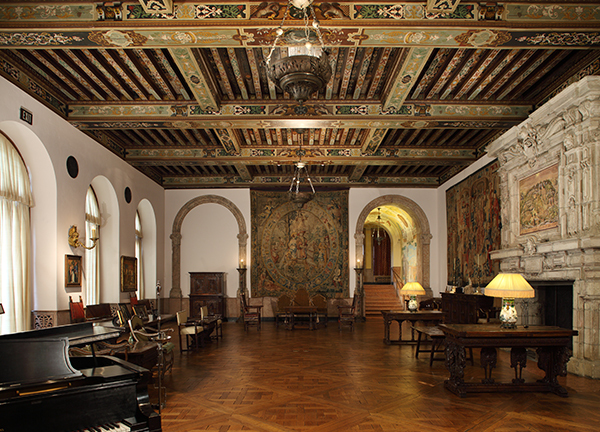 EverGreene conserved the mansion’s historic finishes—luxurious wood surfaces, ornamental plaster, original Caen stone, intricate stenciling and decorative paint—before the museum’s December 2014 opening, revitalizing the space and making it a striking backdrop for the design innovations on display. 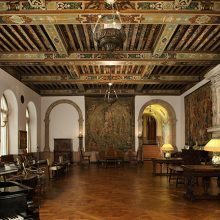 Then, walk hand-in-hand down Fifth Avenue and pop into see the cherubs on The Sherry-Netherland lobby ceiling before arriving at the iconic Rainbow Room at the top of the Rock! 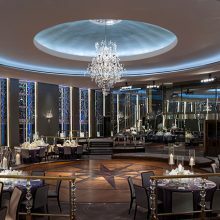 The Rainbow Room is the apex New York City’s glamour and the place for great 3D activities: drinks, dinner & dancing. As part of a major renovation guided by Gabellini Sheppard Associates, EverGreene provided wall coverings and straight painting, installed metallic finishes on walls and ceilings, including gilding and a bas relief wall treatment. 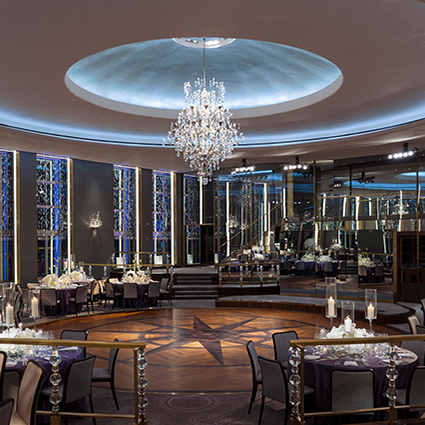 Its legendary dance floor, has been restored through a modern lens to once again embody the glamour and elegance reflective of its rich history. Take in a “Wicked” Valentine’s show at The Pantages Theater, one of the most beautiful entertainment venues in Los Angeles. As host to the most spectacular shows on the national Broadway circuit, it’s a must for creating a night to remember. 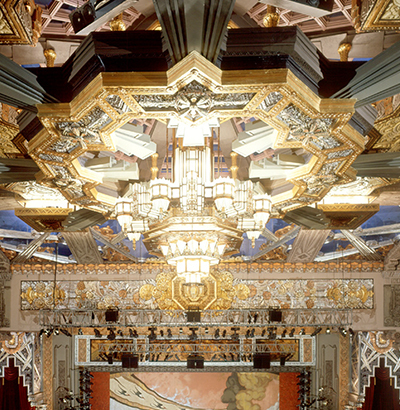 EverGreene restored the Art Deco ornament in the ceiling and walls of the 1930’s theater as well as 85,000 sf of metal leafing (gold, silver, copper and bronze) in the auditorium ceiling and theater lobby. Visit the Polo Lounge at the Beverly Hills Hotel for post-performance tête-à-tête. The Polo Lounge has wined and dined Hollywood’s greatest stars throughout its history. It recently underwent renovation under the guide of designer Adam Tihany, but with the historic color scheme and other decorative elements intact, the revitalized look. What could be more romantic than a stroll through Georgetown? Start your evening at Dumbarton Oaks. The gardens are ranked sixth in the world according to National Geographic, right alongside Versailles. The 19th century Federal-style house was completely renovated and restored to provide an authentic backdrop for the immense collection of Byzantine and pre-Columbian art as well as European masterpieces. EverGreene restored decorative finishes in the Music and Founders Rooms and conserved historic murals throughout the space to return the refined beauty back to this mansion-turned-museum.After taking in the art and artifacts from countries abroad, you have a lot of choices for dinner and drinks: stay in Georgetown and head to the 1789, go to The Tabard Inn around Dupont or head downtown to the Old Ebbitt Grill. The Old Ebbitt was established in 1856, as a saloon in a boarding house and is the oldest restaurant in DC. Although it has gotten around since its 19th century opening, it remains a historical landmark. Celebrity statesmen and military heroes have reportedly quenched their thirsts at the bar, among them Teddy Roosevelt, whose big-game hunting trophies adorn the walls. Designed in 1889 by Adler & Sullivan, The Auditorium Theatre is known for its perfect acoustics and innovative architecture. And on the lovingest day of the year you can catch the Joffrey Ballet. After multiple restoration and conservation efforts, The Auditorium’s stunning decoration (gold-leafed ceiling arches, bas-relief designs and endless wall mosaics and murals by Charles Holloway and Albert Fleury) has been returned to its original gleaming forms. The Auditorium makes a perfect start to a historic Chicago Valentine’s evening.If there wasn’t enough gilding at the Auditorium, head to the Pump Room in Ian Schrager’s PUBLIC Hotel and sit beneath the glittering bar ceiling, gilded by EverGreene. At night, the bar transforms into a supper club, capturing 1930’s-style glamour with a modern twist. The menu includes late night tapas and specialty cocktails by their in-house mixologist.